. Edition of 35. 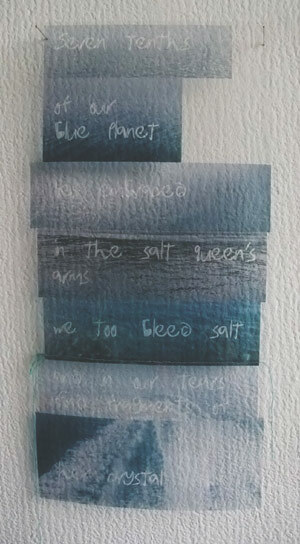 300 Euros, plus p & p.
Photographic collage incorporating a section of a poem by Sen with images of the Baltic, Marmara, Pacific, Atlantic, Adriatic, Irish and North Seas. The sea is borderless and flows from one water mass to another. The sea is one, but is presented here as 'several,' as patches of fabric representing seven seas the artists have visited. That the sea of oneness is experienced as a multiplicity -- for every wave is unique -- is a familar idea in Sufi discourse. The waves and foam are the affected by boundaries of solid matter, and are mutable; in this work transparency allows the texture of the background to interract with the textures in the work itself, in ways that change in the course of a day. 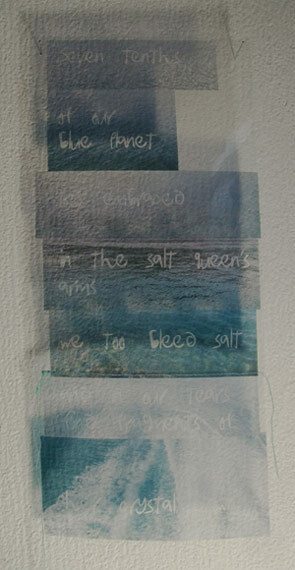 Mismatched patches of sea emphasize distinctions while the text leads the viewer to 'read' the work from top to bottom in sequence. 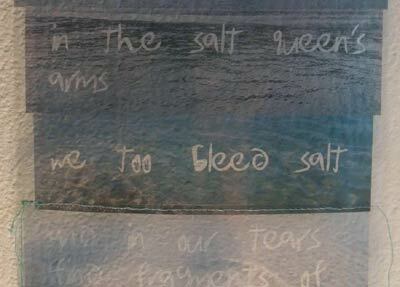 we too bleed salt and in our tears find fragments of her crystal crown." Edition of 35. 300 Euros, plus p & p.